(CNN) -- Mexican voters headed to the polls Sunday for nationwide midterm elections, seen by many analysts as a referendum on Mexican President Felipe Calderon's performance. On the ballots are 500 federal legislators, six governors and mayors and local legislators in 11 states. 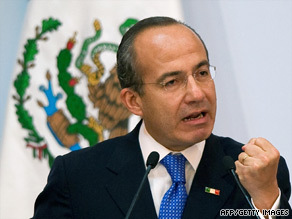 Although Calderon still has three years left in his six-year term and is not on Sunday's ballots, analysts say the elections will gauge Calderon's performance and his party's nine-year hold on the presidency. After a bitterly fought race, the nation went to the polls on July 2, 2006, to pick a successor to President Vicente Fox. The race was so close that the results were not verified until a controversial decision two months later, with Calderon's margin of victory less than 1 percent. Losing candidate Andres Manuel Lopez Obrador refused to accept the results and announced himself the winner. Fistfights broke out in the lower house of Mexico's Congress, the Chamber of Deputies. The first three years of Calderon's tenure have not been much smoother. Perhaps most famously, the president declared war on the drug cartels that have spread corruption, fear and violence across the nation. The war's outcome remains uncertain, but there's no doubt about the human cost: About 10,000 people have died in drug violence since Calderon took office in December 2006. Calderon's job got tougher when the bottom fell out of the global economy late last year and the H1N1 flu outbreak drew the world's attention to Mexico this year. But his actions in the face of such adversity have helped his standing, some analysts say. "Calderon has become increasingly popular in the country, because he did project a certain amount of strength in the anti-drug war," Birns said. "He did stand up to the United States on certain things, like swine flu." Calderon is head of the National Action Party, known as PAN. The other two main parties are the leftist Party of the Democratic Revolution, which narrowly lost the 2006 presidential election, and the Revolutionary Institutional Party, or PRI, which had a stranglehold on the presidency from 1929 until 2000. PAN candidate Fox -- Calderon's predecessor -- broke that hold. PAN has the most seats in the Senate and the Chamber of Deputies but does not have a majority in either. The party could lose seats after Sunday, as most polls show PRI holding a slight lead.